LINCOLN, NEB., OCTOBER 19, 2018 – On Sept. 26, Marco opened a location in Lincoln, Nebraska and celebrated with a ribbon cutting ceremony. With almost 50 employees in Nebraska, Marco needed a space for its Lincoln team. In the past four years, Marco has experienced triple-digit growth in this area. On the ribbon-cutting day, Marco’s Omaha and Lincoln team members gathered to distribute Marco signs throughout Lincoln. After a celebratory lunch for staff, they commenced the ribbon cutting ceremony with the Lincoln Chamber of Commerce. Robert Mastera, Technology Advisor, held the giant scissors and cut the ribbon. “The ribbon cutting was the culmination of a milestone. It represents three years of hard work building our customer base, plus that Marco is a solid resource for business IT and print needs,” Mastera said. The ribbon cutting acted as a tribute to the hard work of Marco’s local employees. “It was symbolic to our dedication to the Lincoln community and a great moment showing the partnership we have with the Lincoln Chamber of Commerce,” Mahnks added. In this market, Marco offers copiers, printers, production printers, large format printers, IT services, phone systems, digital signage, management software and more. As a company focused on employee and client satisfaction, Marco strives to enact the mission of helping customers effectively apply technology that contributes to their success. “One great philosophy, and one great company,” said Mastera of Marco’s positive culture and goal to assist customers. The company plans to continue their active presence in the Lincoln area. 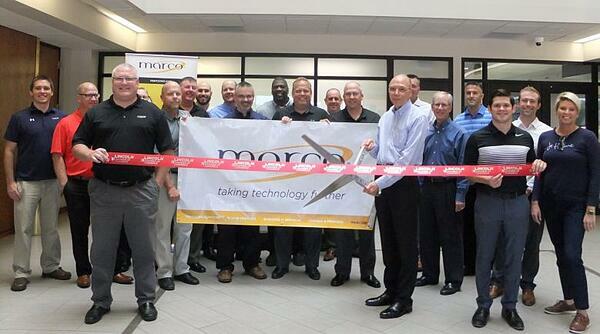 Marco’s Omaha and Lincoln team members cut the ribbon to celebrate the new Lincoln office. Technology Advisor Robert Mastera holds the scissors, while Bart Mahnks helps carry the Marco sign.